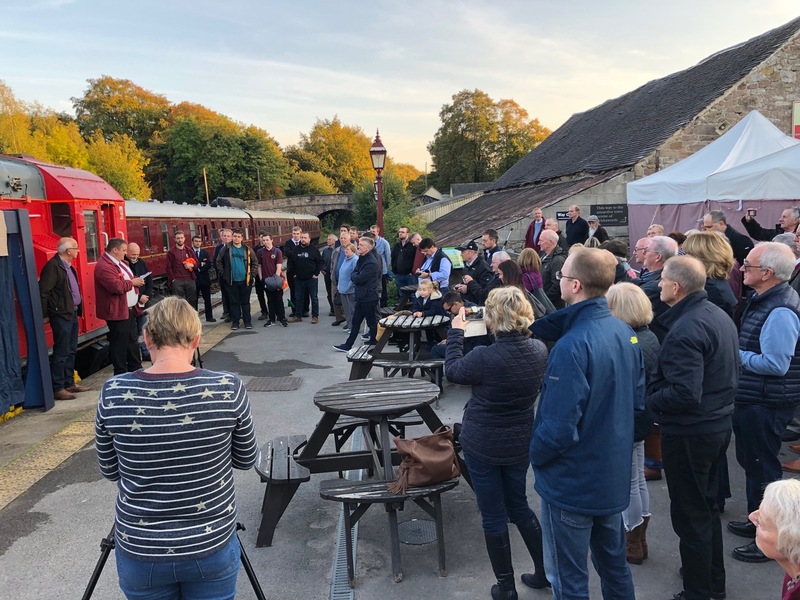 This evening our volunteers met at Wirksworth station to unveil the new name for our '08'. In recognition of the excellent service Graham Walker has given the railway, the volunteers decided to purchase name plates for the loco as a testament to Graham's dedicated mentoring to our younger members. 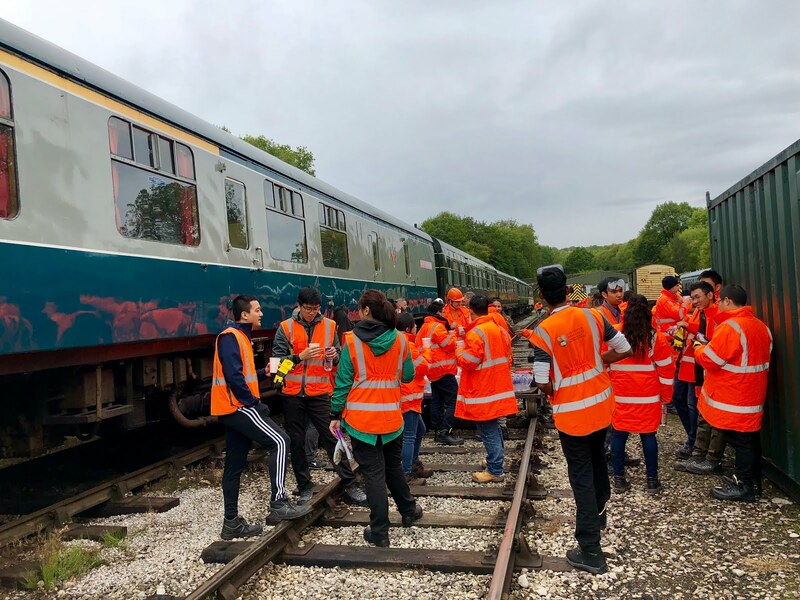 Graham's passion for teaching has ensured they have acquired a range of knowledge and skills that have proven valuable assets to the development of our railway. Both Leigh and Mike gave befitting testaments to Graham's contributions to the EVR with his kindness, humour and friendliness being identified as enduring qualities. A large crowd gather on platform one to witness the unveiling by Graham's sons before enjoying a ride hauled by class 08 'G. R. Walker' to Duffield for fish and chips or Graham's favourite Thursday lunch, a roll, potato fritters (and sometimes a few chips). Sadly Graham was too ill to attend the evening as he is very poorly battling cancer in Derby Royal. Our love and thoughts are with Graham, Anne and their family during this very sad time. Today started with two footplate experiences which both participants and their guests enjoyed. The Wirksworth-Duffield service was hauled by '73210' Selhurst and we enjoyed steady loadings throughout the day. 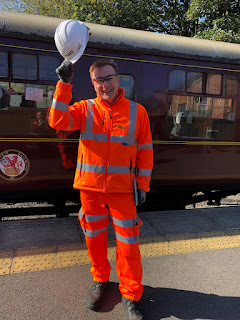 Down at Duffield a representative from Network Rail could be found surveying excessive vegetation near the main line and it was nice to welcome Anton back to the EVR. Down the yard the LMSCA and the Duke's restoration team were in attendance. Today's service was supported by the miniature railway, EVRA shop, station cafe and booking hall staff. The final regular Thursday of the season and a warm one it was too. It was a reasonable day on the trains visitor wise too. It was fairly quiet down the yard but it seemed to take most of the day to shift the coal delivery out of the roadway. Some further work was undertaken on Class 101 50253 with the brakes being adjusted and lubricated. A most pleasant day in the valley and with the previously forecast storm not arriving, it meant that Derbyshire Day could be enjoyed by all. Each train was well loaded and especially the last one which had a coach party on as well as the university students who were travelling back to Duffield. The students have been working all weekend on track work in Wirksworth Yard. We featured quite well on BBC Radio Derby as a result of today which is most pleasing. Down the yard further progress was made on Faraday with more welding taking place as well as underframe painting. Today started with another footplate experience on the incline. Class 33 'Swordfish' made a welcomed return to traction on the Wirksworth to Duffield service. 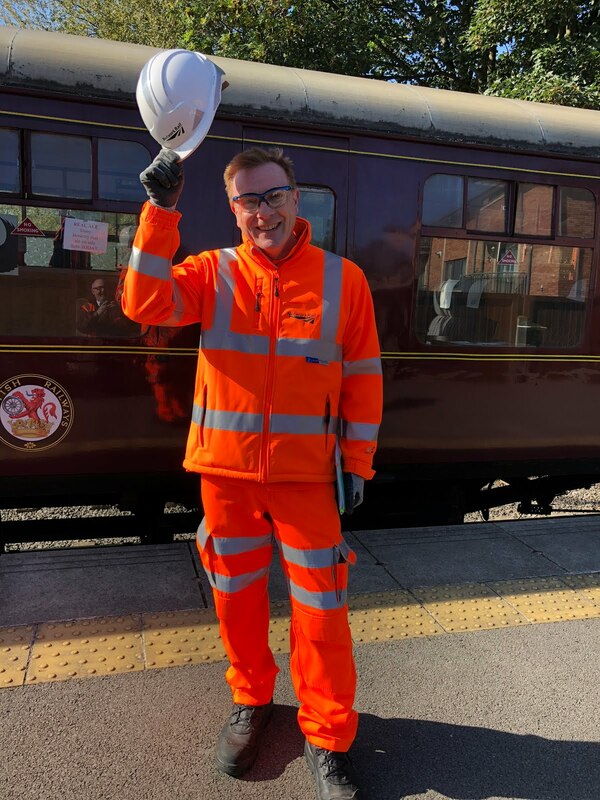 Also making a welcome return was South East Trains driver Jacob Sparkes who was a regular volunteer driver at our railway some years ago before moving to London. A big thanks goes to Will Plant who multi-tasked and undertook the roles of both second and third man on the train. 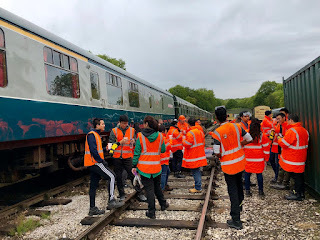 Down the yard our visiting students from the University of Birmingham started their track laying experience which reminded me of that old saying, "you can't make an omelette without cracking eggs…" . The DMU fitters worked on the 08 before completing some shunting in readiness for tomorrow. Both the LMSCA and Duke Support Group were in attendance. As you will know tomorrow is Derbyshire Day and we have some 300 pre-booked visitors descending upon the railway not to mention a pre-booked coach party. The weather forecast is much improved so it promises to be a busy day. If you have a few hours to spare to help, it will be great to see you. Supporting today's service were the EVRA shop, Station Cafe, miniature railway and booking hall staff. Quite a bit of activity for a back end Friday. Firstly, we hosted a Bronze Drive a Diesel Day which was quite eventful, adding to the fun for the participants. 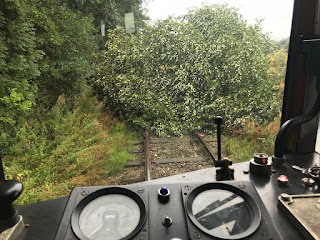 We had swapped round the loco part of the experience to the morning allowing the DMU in the afternoon to collect the University of Birmingham students from Duffield at the end of the experience. However, as per yesterday, the 33 headed off into the rainforest to find another fallen tree at Idridgehay Station. Whilst awaiting assistance, the experience worked between Idridgehay and Gorsey Bank. Thank you to Mike Billings and Mick Kingsley who quickly came in from home with their equipment in hand to deal with the problem. Sensibly they decided to hitch a ride on the DMU to Duffield afterwards and it was a good job they had because there was yet another tree blocking the line near Derby Road 3 bridge! The experience eventually reached Duffield around 15:00, not long before the arrival of the students. Today's team of Lewis and Richard, as well as the lads who assisted with a shuntlette at the end of the day, must have had some patients as there were monsoon rains soaking everyone thrown into the mix. In amongst all this, we also hosted a test customer on the incline who probably got equally as wet. A busy start this morning as a heads up by a volunteer last night lead us to believe there was a tree down over the track because of the wind. We weren't sure what we were going to find so we bravely set off early morning to find quite a large tree down near Bridge 21. Three of us started tackling it with the loppers and saws we had but it soon became apparent that mechanical assistance would be more useful and therefore we headed back to Wirksworth and dispatched the Komatsu instead. Fortunately it was all cleared before the 11:15 train departed and the rest of the line was clear. It wasn't a bad day considering the horrendous weather although it wouldn't break any records. After shunting a test vehicle on to the car park for departure, the Maintenance Team set about continuing an exam on one of the DMUs which will form the Santa set when the time comes. A deputation from Burton came to remedy an oil leak on 33103 which will hopefully mean it can operate it's final passenger duty of the season this coming Saturday. The PW gang got quite wet today as they did some final preparations for the point work they're going to do at the weekend. Today we enjoyed moderate visitor numbers as the colder, overcast weather together with the Derby Station re-modelling works seemed to impact negatively upon our numbers with visitors joining the railway at Duffield Station somewhat less than we could normally expect.The day started with Pete and Chris hosting a footplate experience ably assisted by Richard who, following the experience, conducted a number of yard tours. Today's locomotive 30161 developed a brake fault and was substituted with the 3-car DMU for the first Duffield service but thanks to Joe Marsden et al, the quick fix fitters worked their magic and the fault was rectified and the class 31 conducted the remaining Duffield services. 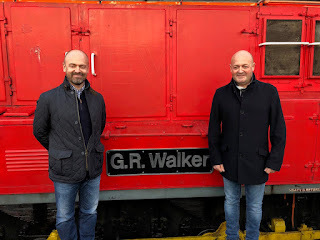 Ian Bowley & John H-Thomson travelled on the train seeking donations towards the Wirksworth Station project and had a most successful day raising just over £100.00 together with signing up some regular subscribers. Incidentally, some workmen turned up today and started lots of measuring and drilling on the building foundations so I assume phase two has started on the construction of the building but have no further information at present. 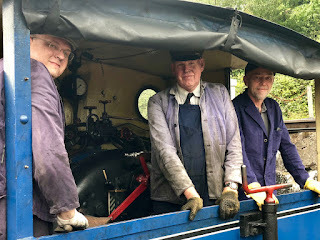 Work on the miniature railway extension continued today in between passenger trips and down the yard the LMSCA and Duke's restoration teams continued working on their respective projects. It was all quiet on the DMU front as many of the maintenance team were enjoying a 'boys jolly' at the Severn Valley Railway. Today's service was supported by the EVRA shop, miniature railway, station cafe and booking hall staff. Thanks also to the train crew who, despite the initial traction problems ran to the timetable. A quiet day generally around the railway today. The Engineering Dept worked on a fuel supply issue on one of 50253's engines which it seems they may have sorted and the toilet pipework and tank refurbishment on Class 101 E51505 continued. No.3 was steamed with a warming fire ready for the weekend. Passenger service on the incline have finished now, save for the 13th and 14th October Model Railway Exhibition Weekend, however driver experiences are continuing. The Commercial Dept were in full flow booking in diesel driver experiences, children's birthday parties etc. 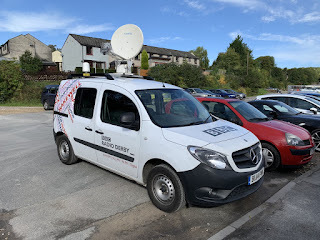 I did a telephone interview this afternoon with BBC Radio Derby to talk about BBC Derbyshire Day which we are taking part in on Sunday 23rd September. Whilst I can't reveal how many tickets were on offer, we can just say that the ticket allocation we provided them with has nearly all gone at the time of writing which is very quick indeed as they only became available this morning! A reasonable day today for a back-end Thursday with plenty of people using intermediate stations too. There was plenty of activity in the yard as the Komatsu the faulty alternator removed for repair and further preparation work took place for the installation of the new point in the yard next weekend. First thing the DMU formations were altered slightly to reinsert the centre car in preparation for Derbyshire Day on the 23rd. The coaching stock was shuffled around to remove the two coaches primarily used for dining as on train catering has finished now for this season. The spare SK was added to the rake as there are a further three scheduled loco hauled days remaining this season. At the end of the day, we waved goodbye to the black Ruston shunter 11520 which was one of the first locomotives on site but has been out of service some while. It has moved on to the Heritage Shunters Trust. All the bustle of operating on Fridays has now passed and it was a much more sedate day on the railway today. Now that public services have stopped on Fridays, we are back to the Driver Experience season and today we had a Bronze Drive a Diesel Experience who enjoyed the 101 two car set this morning followed by a Class 31 this afternoon. They enjoyed lunch in the cafe inbetween. Down the yard, Henry Ellison was steam tested ready for tomorrow and the Maintenance Facility was shunted to allow work to continue on the projects contained therein. Some work was done on the lawn at Duffield now the weather has cooled down. The main summer season is over now but trains are still running Tuesdays and Thursdays in September along with weekends. Today was an average sort of day with an array of walkers and the like enjoying a day on the railway. The yard at Wirksworth was fairly hectic as the SO was returned to the rake of coaches and testing took place on the incline. The PW were in full swing preparing for the installation of a new point in the coming weeks which will eventually offer us some additional siding space. Despite the number of major tourist events taking place today in Derbyshire the railway enjoyed good visitor numbers. The day started early with Pete and Andy hosting a footplate experience on the incline before providing a scheduled service. In between services Richard conducted a number of yard tours. Our second steam locomotive service was provided by the miniature railway team who have clocked up an estimated 84 miles of passenger traffic this year so far. The team were kept busy today with a string of both young and not so young passengers. The Duffield service was class 31 hauled with a number of enthusiasts taking advantage of our all day rover ticket. This afternoon our catering team provided an afternoon tea service to a pre booked party. This evening we ran our ever popular Jazz and Fish & Chips special service to Duffield.